From patient preparation to hand washing, from equipment to basic surgical procedures, this highly practical manual by Drs. 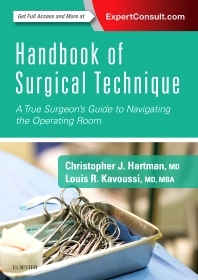 Christopher J. Hartman and Louis R. Kavoussi, provides students, residents, and clinicians with a firm foundation in the core techniques and skills required for the operating room environment. Concise and easy to read, it uses a highly illustrated, step-by-step approach to teach the must-know information common to the culture, resources, and processes of today’s operating rooms. Provides a quick yet thorough overview of surgical principles, techniques, instruments, and supplies commonly encountered in the OR. Features detailed illustrations and intra-operative photographs that detail each step of the procedures. Includes access to high-quality videos that demonstrate key skills such as surgical hand scrub, assisted and self gloving and gowning, skin incision, suturing techniques, tying knots, and more. Explains the roles within the OR, the behaviors needed to excel in this demanding environment, equipment and tools, basic surgical techniques, and tips for assisting and integrating smoothly into the surgical team. Ideal for any professional in the operating environment, including medical students, residents, surgical techs, physician assistants, and nurse practitioners. Expert Consult™ eBook version included with purchase, which allows you to search all of the text, figures, and references from the book on a variety of devices and to access the accompanying videos.